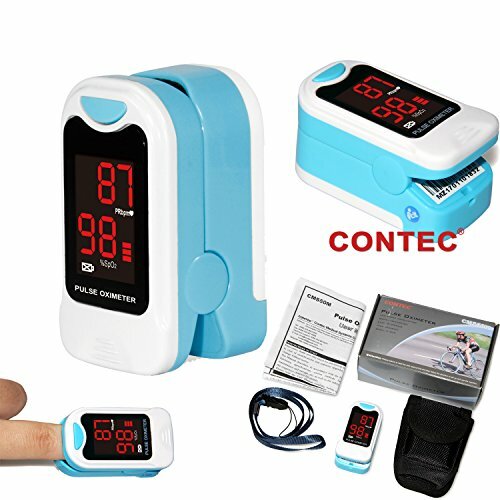 The CONTEC CMS50M finger tip pulse oximeter,is a lightweight, portable device used for measuring both heart rate and blood oxygen levels or SpO2.Read accurate results for Oxygen Saturation and Heart Rate on a LED display with an accuracy rate of ±2%. Screen Rotation and Screen Brightness Options Available. Continuous bar-graph display, the higher display indicates a stronger pulse. Pulse waveform shows the Pulse Rate. Screen automatically shuts off after 5 seconds of inactivity. Use two AAA batteries for 20 hours of use! Simply place your finger inside the antimicrobial vinyl sensor and have these vital measurements instantly displayed on a vibrant LED screen NOTE: this product is intended for sports and aviation use only and is not a medical device.We are the direct manufacturer, there is a clear screen protector which can be removed before use. If you have any questions about this product by CONTEC, contact us by completing and submitting the form below. If you are looking for a specif part number, please include it with your message.